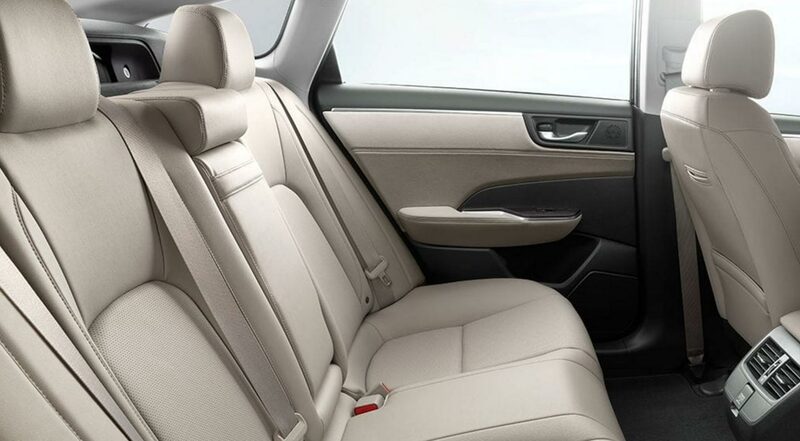 From its standard 8-inch touchscreen display with Apple CarPlay and Android Auto integration to an available Honda Satellite-Linked Navigation System, the Honda Clarity's interior comes well-equipped with the high-tech convenience features that drivers crave. Say goodbye to that feeling of wonder if you locked your car with the Smart Entry with Walk Away Auto Lock feature of Honda's new plug-in hybrid. With the advanced plug-in hybrid powertrain of the 2018 Honda Clarity, drivers can enjoy a 47-mile all-electric range rating, plus a 340-mile combined gas-electric hybrid range. The Clarity's battery can be fully charged in as little as 2.5 hours with a 240-volt charger, which means many drivers can recharge daily and commute or drive around town completely on all-electric power! For those longer drives out of town, the extended-range of this gas-electric hybrid delivers the practicality you need. The 2018 Honda Clarity plug-in hybrid delivers driving enjoyment that few other hybrids can muster. Thanks to a Honda VTEC engine paired with an electric motor, the 2018 Clarity develops a total system output of 232 lb-ft of torque and 181 hp, making this one fun-to-drive plug-in hybrid! Plus, with selectable drive modes including Normal, ECON and Sport modes, the new Clarity provides a tailored driving experience. Utilize the HV Mode to regenerate up to 50% of the car's all-electric range and optimize charging conditions. The highly advanced nature of the 2018 Honda Clarity plug-in hybrid extends to its safety systems. Honda Sensing comes standard on every 2018 Clarity plug-in hybrid and includes smart driver-assist features like Adaptive Cruise Control with Low-Speed Follow and Honda's Collision Mitigation Braking System, which together enhance your safety and avoidance of potential frontal collisions. The Lane Keeping Assist System and Honda LaneWatch features of the 2018 Clarity help alert and keep you informed of your position in your lane and vehicles that may be in your blind spot. Every aspect of the new Honda Clarity's exterior shape and styling was influenced by aerodynamic efficiency and good, clean design. Its sleek, aerodynamic shape helps reduce drag as well as wind noise, while its long and roomy cabin provides greater passenger space for all five seating positions than smaller hybrids.